Nice pizza but the amount of topping is minimal.The pizza I got was unevenly distributed with the toppings and I had to rearrange the pepperoni to make it even. 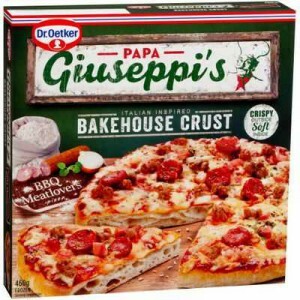 Papa Giuseppi’s bakehouse meatlovers pizza is a easy snack option that tastes okay for a frozen pizza,it is quick and easy but does not compare to a normal pizza. A pretty good pizza. The base is excellent and generous toppings. Plenty of meat, maybe needs a little more cheese. Good for quick and easy meals. Not my favourite kind of frozen pizza. Despite the Italian name, I don’k think that they are any better or worse than supermarket brands at half the price. We usually prefer thin base pizza, but this Papa Giuseppi’s Bakehouse Crust range is also one of our favourite. The base looks very thick, but amazingly it’s really light! The BBQ sauce is tasty as well. Love papa giuseppis pizzas! I’m not a huge fan of the ground beef but the pepperoni is really nice, the cheese cooks up nice and crispy on the edges and the base is really soft and fresh! Delicious! How would you rate Papa Giuseppi’s Bakehouse Crust Meatlovers?